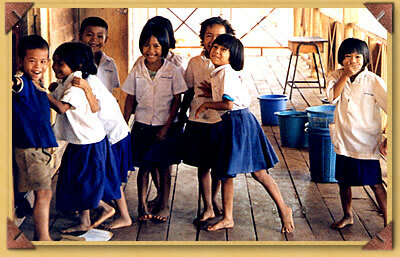 Children of Isan Thailand exchange secrets in front of their classroom at the Nongboat School which is supported by Amicus. Over 500 children from the community attend the school. Playful, hopeful and sweet as can be,these children face a harsh future. 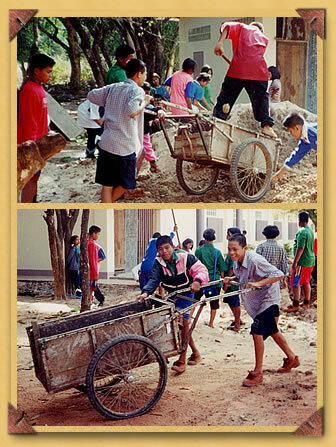 Students, teachers, community members and local resident farmers helped with the completion of the Nongboat School project. It is hard to imagine the feeling of pride and accomplishment that comes along with the completion of such an undertaking. In a place such as Isan, where life is so difficult, the significance of such an achievement is indeed profound.